By using online E-cards and E-invites your website visitors can provide a friendly and personal link to your organization and other members or visitors. This can greatly increase the ministry range of your organization by providing a contact point for members and visitors all around the world. The process for creating and sending an e-card or e-invite is very similar to the process for a physical card or invitation. First, you must create the card or invite. Then, users can distribute the selected card or invite to friends and family. The recipient opens the card and receives the message. 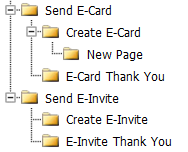 Steps to create e-cards and e-invites are the same, just substitute the relevant name as needed. •E-Cards – This page is where a user can browse through a listing of the e-cards you have created and made available and select one to send to a friend or relative. While it is not required that this page be located behind a secure login, due to the fact that sending these e-cards uses internal email settings, you are advised to place this page in a secure section of your website. It should also be visible in navigation. This page requires the E-Card Category List module with your Create E-Card page selected as the Card Entry Page setting, and you need to enter the Card Type ID found in the Card Type lookup table for the type you wish to use (e-card or e-invite). •Create E-Card – Once a user selects an e-card to send, the Create E-Card page allows the user to specify the sender, the recipient, their email addresses, and a brief personal message, to display along with the e-card’s own message. This page should be a child page of your E-Cards page, and it should not display in navigation. This page requires the E-Card Message Entry module with your E-Card Thank You page as the Redirect page. •E-Card/E-Invite Thank You – This page is for thanking users for using an e-card or e-invite. This page should be a child page of your E-Cards page and should not display in navigation. This page requires the Advance HTML Text module and has no required settings. Note that you can use the same Thank You page for both e-cards and e-invites if you wish to. •E-Card/E-Invite View – This page is where the e-card or e-invite displays. This page should be a child of your Home page (where it should not require a login) and should not display in navigation. You can create a custom template for this page either to remove all other elements and just show the e-card or e- invite or to adjust your normal navigation and content areas to fit around the e-card or e-invite properly. This page requires the E-Card Display module and has no required settings.